Wow how the time flies by these days! I wanted to take a few moments to let you know how happy I am that Fall has arrived :) I love this time of year. We have yet again been super busy these last couple months as I have been MIA from here. Buying a home has been extremely consuming fun however, I hope to be back a little more regularly and share some of our wonderful home updates we have been hard at work on. 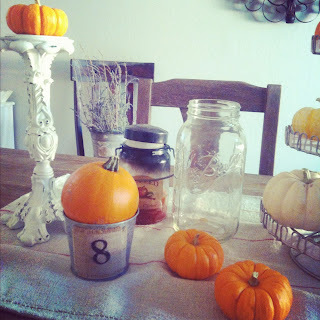 Here is a little sneak peek at my Fall table from Instagram!